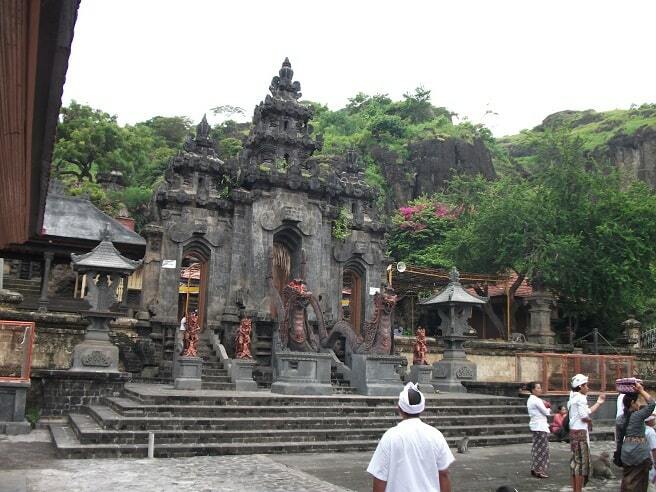 "This is another beautiful temple located at North Bali, somewhere in the Pulaki village. If you travel from Denpasar, you will arrive in three hours. If you go to the west via Negara ( a town in West Bali) you will pass the Bali Barat National Park which is ideal trekking place." The Pura Agung Pulaki temple commemorates the arrival of the Javanese priest Nirartha to Bali in the early 16th century. 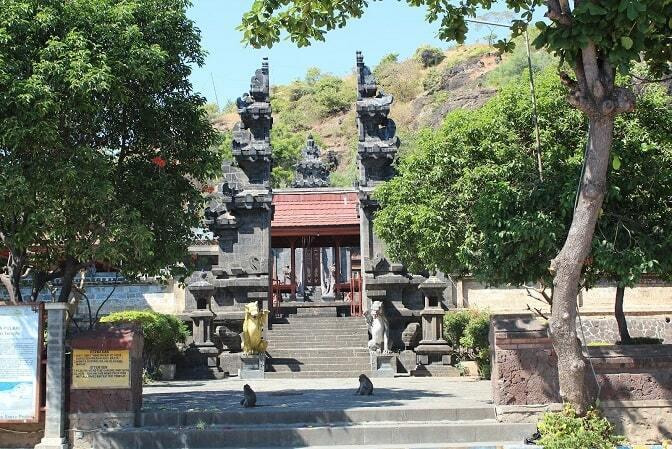 The temple is located about 7 km from Pemuteran and an hour's drive (48 km) from Singaraja. The Pura Pulaki is one of the six most sacred temples of Bali counted. This temple is situated on the flat plateau with rocky hills as a backdrop. The grey rocks behind the temple rise up like a cliff. Just before the temple is a road that the Pulaki temple separates 25 meters from the blue sea. In the jungle behind the temple live many monkeys (macaques). 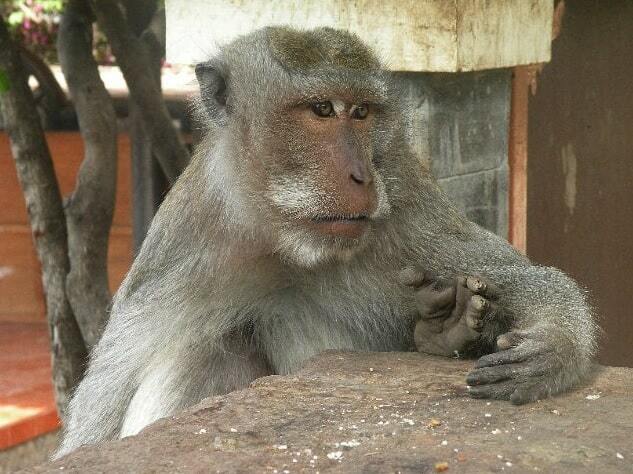 It is said, that when Danghyang Nirartha settled here, the macaques escorted him into the jungle. Out of respect for him, they settled in the temple as a guard. Pulaki temple is surrounded by several temples. They are at some distance from the temple Pulaki. Pulaki is the center of the temple complex, which is called "Pesanakan". The surrounding temples are: Pemuteran Temple (1 km - west), popular for its hot springs, Kerta Kawat temple (2 km - southeastern) and Pabean Temple (400 meters - north east). The legend, which belongs to this temple, says that Nirartha had a very beautiful daughter, named Swabana. She was coveted by the king of Pegametan (a village west of Pulaki) and those abducted her. The Holy Nirartha cursed the village, which shortly afterwards burned to the ground. The inhabitants turned into demons. However, Swabana was deprived of her virtue, but she got from Melanting Dewi, a place among the gods. Dewi Melanting is considered the goddess of business success and prosperity, she is the patroness of the merchants. Almost every big market in Bali has a small altar, which is dedicated to her. The black stone gate of the Pulaki temple was built in 1983 and was inaugurated with a ceremony. For this, they took holy water from several temples from East Java to Lombok. The shrines and ornaments of this holy temple are dominating by black color. Like any other temple in Bali, Pura Pulaki divided into three courtyards, Jaba, outer court, Jaba Tengah, center courtyard and Jeroan, the forecourt. When you enter the temple, there are three stages. Once in the middle courtyard, you see on the left and right side the green jungle hills and behind you is the blue sea. You'll still have to climb more stairs to get to the main courtyard where people pray and sacrifice. The main courtyard is no longer quiet, as it should be, because the monkeys are waiting appearances and are looking for the right time to steal fruit of the sacrifices! The locals are accustomed to the monkeys and they do their prayers with full concentration. Even more spectacular views can be seen from the upper part of the temple complex. There is a narrow path, which can be a bit smooth on rainy days. Make sure you take this path, when you visit the temple. You're walking then through rice fields of the local population, while your eyes are seduced by the picturesque scenery of the ocean and the hills. The sound of the sea will give you cool feeling, if you're walking on a warm sunny day. Entering the temple complex is only accessible with a sarong and sash. You can hire these at the entrance for a little amount. Despite these monkeys are more peaceful than the monkeys which live in the "Monkey Fores Park", it is important to take care of your stuff. Do not forget to leave your sunglasses and other matters behind in the car. Monkeys will always try to get from you. The parking lot is full Warungs. The temple is also a convenient stop for truck drivers on their way to and from the ferry terminal in Gilimanuk. The nearby beach is Pantai Gondol. It has clean white sandy sand, coral reefs and you can do here excellent snorkelling.